When Jayla was six, she wrote a journal entry about what is disgusting–or as she brilliantly called it: uscuseen. And Jayla is right. The rat is uscuseen. So is the fact that the three females in the picture have nicer handbags than me. Thanks to Jayla’s mom, Veronica, for submitting this treasure from Jayla’s first grade journal. You can see more of Veronica’s gems at Mamma Bird Musings. Now tell us: what do you find uscusseen? 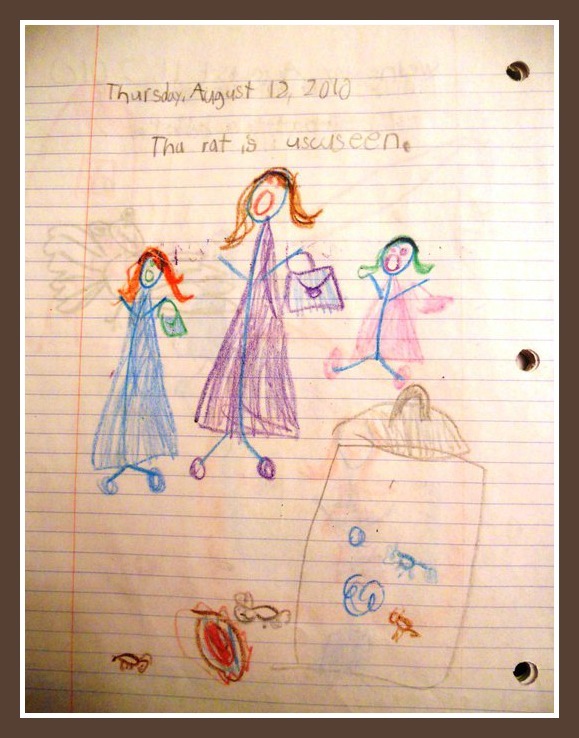 Posted on March 6, 2012, in Diaries and Journals and tagged Chase McFadden, funny kids writing, Humor, Leanne Shirtliffe, Mamma Bird Musings, Stuff Kids Write. Bookmark the permalink. 4 Comments. Oh, I love it. Love the spelling! Kids crack me up with their primitive writing. Cute. HAHAHAHAHAHA. This made my morning! Now I can go to work (where I probably still won’t make a enough to get a bag that nice)! Reblogged this on Pressing Miles Matters.